A disease of the retina, the light-sensitive membrane at the back of the eye, associated with diabetes. After having diabetes for 20 years, nearly all people with Type 1 diabetes and more than 60% of people with Type 2 diabetes develop retinopathy. The retina translates light entering the eyes into nerve signals that travel through the optic nerve to the brain. Diabetes can disrupt the proper functioning of the retina. In the earliest stages of diabetic retinopathy, the tiny blood vessels of the retina become more permeable and begin to leak fluid into the vitreous, the gel that fills the eye. This can cause swelling in the macula (the central part of the retina responsible for sharp vision), a potentially sight-threatening condition called macular edema. As diabetic retinopathy progresses, the blood vessels are unable to supply the retina with adequate blood, a condition called ischemia. Starved for oxygen, the retina responds by growing new blood vessels (a process called neovascularization), but these new blood vessels are abnormal and tend to leak blood into the vitreous and cause scarring. 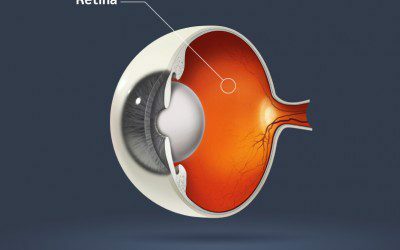 In some cases, scar tissue can pull on the retina and cause it to detach, creating blank spaces in the field of vision. Although laser surgery usually can help save some vision, diabetic retinopathy remains the leading cause of new blindness in people aged 20–74 in the United States. There are a number of measures that can help prevent or slow the progression of diabetic retinopathy. One is blood glucose control. The Diabetes Control and Complications Trial showed that intensive blood glucose control can lower the risk of developing diabetic retinopathy by 76%. A number of studies have shown that tight control of blood pressure can also substantially lower the risk. In people with existing diabetic retinopathy, laser treatment can be used to destroy abnormal new blood vessels, which can help to save sight. (Laser treatment can also be used to save sight in people with macular edema.) The eye drug Lucentis (ranibizumab injection), approved by the US Food and Drug Administration to treat diabetic macular edema, may also be useful in people with diabetic retinopathy. Since diabetic retinopathy is most treatable in its earliest stages, it is important to catch it early. Currently, the American Diabetes Association recommends that adults and children 10 and older with Type 1 diabetes have an initial dilated and comprehensive eye examination within five years after they are diagnosed with diabetes. People with Type 2 diabetes are advised to have a dilated and comprehensive exam shortly after the diagnosis of diabetes. After the initial exam, everyone with diabetes is encouraged to have a yearly exam.